What's the Difference Between a Ministry, Theology, and Divinity Degree? 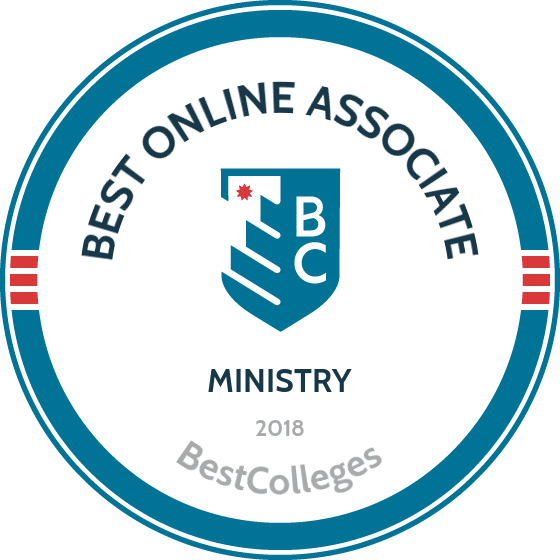 What Are The Best Online Associate in Ministry Programs? What Will I Learn in an Online Ministry Program? What Can I Do With an Associate Degree in Ministry? An online associate in ministry prepares students for Christian-based careers like minister of a small church and director of youth ministry in the U.S. or abroad. Ministry programs offer students strong philanthropic skills that are useful in religious contexts, such as local churches, and in secular contexts, such as international relief organizations. According to the Bureau of Labor Statistics (BLS), employment for jobs in ministry is projected to grow 5% to 8% between 2014 and 2024, which is an average rate of growth. While this degree is a good first step toward earning your master of divinity or theology and becoming a Christian minister, there are also several entry-level opportunities for graduates with associate degrees in this field. While ministry, theology, and divinity degrees are often referred to interchangeably, these degrees are actually separate programs. An associate in ministry is designed for individuals who are interested in supportive work in Christian churches and organizations. This degree provides students with a foundation in ministry, but it does not prepare them for pastoral ordination. A master of divinity degree takes about four to five years to complete and is typically designed for individuals interested in pastoral work; many Christian denominations require pastors to hold an MDiv degree. A bachelor or master of theology involves a more academic approach and features studies in church history, hermeneutics, theology, apologetics, and global studies. Associate and bachelor's degrees in ministry provide students with the basic skills needed to work with Christian churches and organizations. This degree does not prepare students for ordination, although many graduates with ministry degrees continue their education and earn divinity or theology degrees. Ministry classes include biblical studies and youth and student ministries. Possible Careers: Graduates with this degree earn positions as relief workers, missionaries, youth pastors, nonprofit workers, and directors of church groups and Christian organizations. A master of divinity is a four to five year program that prepares students to be ordinated in a Christian church and to meet the leadership needs of Christian communities. Typical courses in this program include biblical studies, global and community engagement, and history of Christianity. Possible Careers: This degree prepares individuals for careers as pastors, bishops, or higher education teachers. It also prepares them for secular careers in public arena advocacy, teaching, and counseling. A bachelor or master of theology provides students with academic knowledge through the study of church history, global issues, and language. This degree often involves more extensive academic research, analysis, and writing than divinity or ministry degrees. Typical classes in theology programs include introduction to Islam and biblical Greek and Hebrew. Possible Careers: A theology degree prepares individuals for careers as pastors, high school teachers, college professors, missionaries, and journalists. PIU offers an online AA in ministry. This online ministry school is ranked second among online programs in North Carolina and fourth in the nation for Bible colleges. PIU allows distance learners to choose from several class-delivery methods; the integrated method allows students to participate in lectures through the school’s online learning platform, and the “flipped” class structure gives students freedom to watch lectures on their own time, while providing opportunities to communicate directly with professors. To offer these options, PIU limits online enrollment to 15 students per class. Classes are offered in seven-week sessions, and applications are accepted during six periods throughout the year. PIU is accredited by the Transnational Association of Christian Colleges and Schools. OCU was founded in 1948 to educate members of the clergy to lead in the Christian Union. OCU’s AA in christian ministry is offered with two concentration options: biblical studies and pastoral ministry. The program teaches students to lead with Christian influence in secular, religious, personal, and professional areas. Coursework comprises religious studies and general education classes, such as psychology and math. Regardless of concentration, students earning their online ministry degree at OCU complete at least 60 credits. Each class may be completed in five weeks. Dual enrollment opportunities are available to help high school students get a head start on college credits. NOBTS, a Baptist school, offers two online ministry degrees: an AS and BA in ministry. The online associate in ministry degree is a 70-hour program that prepares students for further study or for careers as leaders in the church. The AS program requires 37 Christian ministry core credits and 12 elective credits. Students may also pursue certification in Christian ministry, biblical studies, or Christian education. Each certificate requires 18 credits. Many classes required for these certification programs are also required to earn an AS or BA, which means students may apply coursework to both their degree and certification. Distance learners access classwork completely online, and NOBTS has no on-campus requirements for online students. GCU’s AA in leadership and ministry prepares students for an avocation or vocation in ministry. Students are encouraged to think biblically in all aspects of life. Coursework focuses on leadership, teaching, preaching, general ministry, and seminary training. The curriculum comprises mainly religious coursework, but some general education classes are required. The program consists of 60 credits, and most full-time students earn the degree in two years. Online class sizes are small; 10 to 16 students are admitted per enrollment period. GBC accepts applications three times per year. Distance learners access all course materials fully online, and there are no on-campus or residency requirements. Online students pay the same tuition rate as in-state students. BC’s online ministry school provide students with the education and skills they need to lead in the church. Graduates of BC’s online AS in Christian ministries understand the practical and spiritual applications of ministry, comprehend Christian theology, and lead in ministry settings. Of the 65 required credits, 42 are devoted to religious studies and 23 comprise general education classes in areas such as math, sciences, and humanities. Most full-time students earn the degree in two years. Students may apply credits earned during the AS degree program toward a BA in Christian ministry. BC is accredited by the Commission on Accreditation of the Association for Biblical Higher Education. Classes, assignments, and skills acquired will vary depending on the program and school you choose for your online associate in ministry degree. However, below you can find a sample curriculum for this degree. Introduction to the Old Testament: This class examines the Old Testament through the lens of contemporary ministry. The course prepares students for work as Christian teachers, ministry directors, missionaries, and other Christian organization leaders. Church History: This course offers a survey of the movements and ideas that have influenced and formed the Christian church. Students will gain the foundational knowledge necessary to eventually become ministers, missionaries, and other Christian leaders. Systematic Theology: Offering a survey of the Christian belief system, this class considers a variety of perspectives on scripture but emphasizes those of the Christian church. The course prepares students for mission work and positions in other related fields. An associate degree in ministry prepares students for several occupational and educational paths. The degree provides students with a strong foundation in Christian teachings, and many students with associate degrees in ministry continue their studies and earn degrees in divinity or theology. While most graduates with this degree work in Christian fields and eventually become ministry directors or pastors, many graduates also work in secular fields, such as counseling, teaching, and nonprofit work. It is common for students with associate degrees in ministry to work as Peace Corps volunteers. This degree is a good fit for individuals who are already active in their churches and are interested in Christian leadership positions or Christian-based global nonprofit work. This degree is also fitting for individuals who have a gift for public speaking and teaching, are driven by a sense of personal calling rather than by a desire for financial success, and are interested in humanitarian work. Youth pastors work with a church or Christian organization's youth population through outreach and other activities. These Christian leaders are responsible for organizing meetings, mission trips, fundraisers, and classes for middle school, high school and college students. Relief workers typically work on the frontlines of recovering from natural or manmade disasters. Duties for this occupation include providing emergency aid, coordinating volunteers, and communicating with government agencies. A director of ministry works as a leader in one of many specialized areas, including children's, ministry, single's, and senior adult ministry. Ministry directors perform management, administrative, and project management tasks. An associate degree in ministry is a strong first step towards formal Christian training. Many individuals earn their associate ministry degrees in order to supplement their secular careers with leadership work in their church. Students who earn an online associate degree in ministry often transfer to a bachelor's program, which can make them more competitive candidates for jobs in ministry, worship, church leadership, education, and nonprofit work. A bachelor's degree in ministry also prepares students to earn a master of theology or divinity. Below are a few common degrees that individuals with an associate in ministry pursue. Bachelor's Degree in Ministry: A bachelor's in ministry allows students to complete advanced studies in Christian leadership skills. The degree emphasizes hands-on experiences in a church setting and the practical skills needed for global work and the knowledge of Christian belief systems. Bachelor's Degree in Christian Counseling: This degree provides students with a foundation in counseling from a Christian perspective. The degree focuses on theories of psychology and Christian counseling methods and prepares students for nonclinical positions in counseling and psychology. Bachelor's Degree in Biblical Studies: This degree involves a contextual and historical exploration of the Bible, including studies in the Old and New Testaments and in systematic theology. It prepares students for careers in advanced church ministry positions or for further studies in divinity and theology. The salary that you earn after receiving your associate in ministry depends on your position and employer. Graduates with ministry degrees often work in unpaid mission or relief work positions for a few years before moving on to paid positions. Below you can find information from PayScale for the median annual salaries for common ministry positions. The salary you earn after earning your associate in ministry also depends on your level of experience and your location. Below, is a table with data from the BLS regarding the highest paying states for general clergy and ministry jobs. The table also features data regarding the estimated number of individuals working in clergy and ministry positions in each state. Students enrolled in online associate in ministry programs can access several scholarships and grants from local churches and Christian organizations. While certain churches only offer scholarships to members, other organizations offer scholarships to any Christian students or to students from certain denominations. The Cannon Endowment Scholarship, for example, is awarded to students who are members of the Presbyterian church, the United Methodist church, the Christian Church Disciples of Christ, or the United Church of Christ. In order to better understand federal funding opportunities, make sure you complete a FAFSA form.